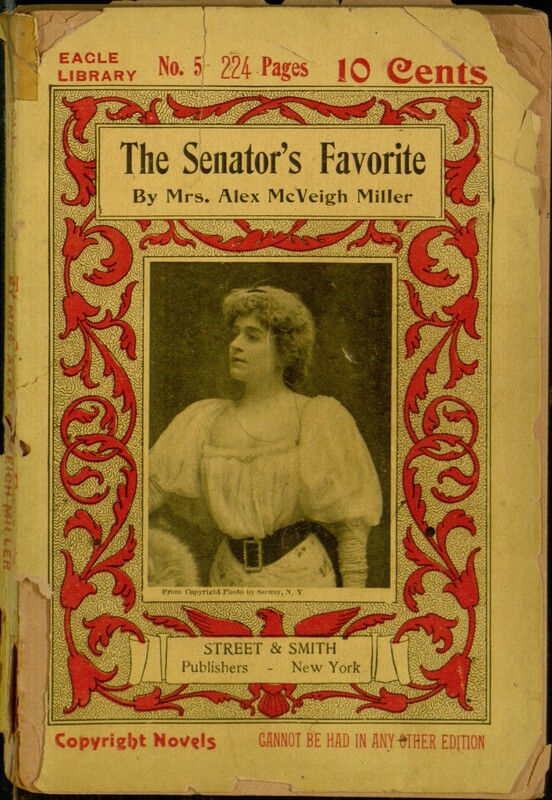 Our latest Project Gutenberg release, produced with the help of Distributed Proofreaders, is The Senator’s Favorite, a rare sequel in the output of prolific story paper author Mrs. Alex. 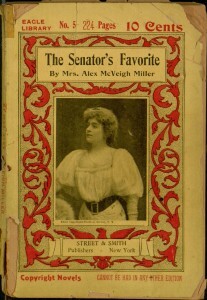 McVeigh Miller, following on from her much earlier novel, The Senator’s Bride. While the previous novel’s happy ending left a fairly obvious setup for where a sequel might lead, The Senator’s Favorite does not follow this path of least resistance. Instead, it largely sets up a whole new generation of characters, with the leads of the earlier story having relatively limited roles. Surprisingly (in a novel that otherwise follows the expected melodramatic formula), the story provides sad fates for some of the previous novel’s protagonists; Mrs. Miller wrote in her autobiography of feeling frustration with the unrealistic requirement for a happy ending to every story, and it seems that this sequel gave her a rare opportunity to retroactively work around that necessity. The complete text of the book is now available for online reading or download through Project Gutenberg.